From time to time in this series, we’ll take a look at older neon signs that are not being operated throughout the city of Birmingham. 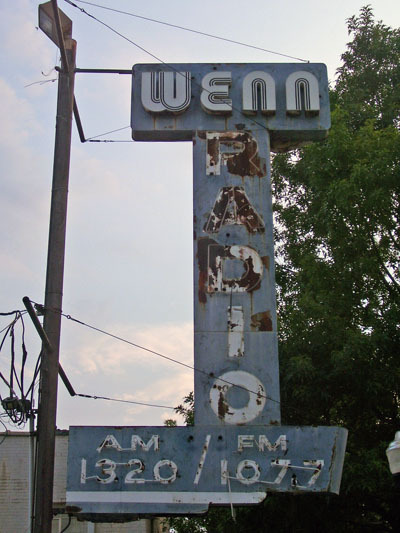 There is not a better sign to start this component of the series than the sign formerly used by WENN 107.7 FM. The sign is located on 5th Avenue North between 16th and 15th Streets North. The sign represented both the AM and FM stations owned by prominent African American businessman A.G. Gaston (link courtesy of Bham Wiki, see this previous link). The call letters are currently used for ClearChannel Communications owned Hallelujah 105.5 FM, a gospel station. The original frequency has returned to its roots as an urban contemporary station. Click here to view the Wikipedia entry on the history of the station. Click here to view the signs previously covered in this series. Look this weekend for a page created to make it easy for those interested in this study of Birmingham’s neon signs to look back at previous entries. What happened to the gospel station 105.5 fm? Why didn't we get a warning about he changes that were gonna take place. This weekend I plan to add links to a map to show where the locations of the signs are. It should be completed no later than Sunday afternoon. Some of the listings already have their locations linked to a Google map, but it's tough to tell where the links are sometimes due to the theme I'm using. I'm looking at changing the theme later on this summer. This is a really neat series and I have enjoyed looking at the pictures. Do you have the locations listed for all of these signs? I'm thankful for the post here listing where the radio station sign is, but some of the others. I'm unfamiliar with.